Latest World News. Find every day short and brief information composed of titles and subtitles and continue reading if interested. The number of those detained in France’s nationwide Yellow Vest protests on Saturday, has reached a staggering 1,723. In Paris, the major hotspot of unrest, scores were injured as rallies continued even after sunset. Film from Ruptly news agency in the capital shows police facing off with demonstrators, who vented their anger well into the late hours. The footage captured officers chasing down demonstrators and later handcuffing them. Some of them were dragged down the road by law enforcement and placed face down while surrounded by officers. 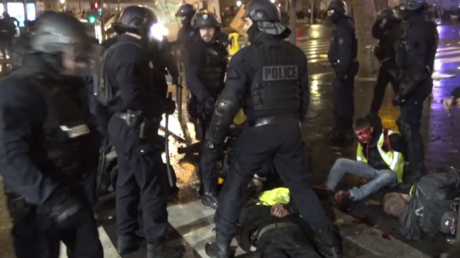 Several people wearing the now iconic yellow vests are also seen in the video with their faces covered in blood. According to the latest figures provided by the Interior Ministry, 135 people were injured in Paris alone, while the number nationwide has risen to 264. Police also took a beating, with at least 17 officers receiving injuries in the mayhem. With the country plunging deeper into chaos, authorities made a record number of detentions during the December 8 rallies. Data provided by Interior Minister Christophe Castaner indicates that at least 1,723 were detained and over 1,200 of them were ordered into custody. The figures topped last Saturday’s mayhem, when over 400 arrests were made. This Saturday was the fourth consecutive weekend of protests, with authorities calling in reinforcements to beef up security. That included sending armored vehicles of the country’s military police (Gendarmerie) to Paris. The hardware was deployed near the iconic Arc de Triomphe, the scene of previous clashes. Speaking on the aftermath, Paris Deputy Mayor Emmanuel Gregoire confirmed that the latest violence caused “much more damage” to the capital, compared to the previous protests. The unrest, triggered by the controversial plans for fuel price and tax hikes, seems to be far from dying down. Earlier this week, the government said it has abandoned its plans, but people still took to the streets across France, demanding more concessions from the government, including lower taxes and cost of living, and even the resignation of Emmanuel Macron. Martin is an enthusiastic programmer, a webdeveloper and a young entrepreneur. He is intereted into computers for a long time. In the age of 10 he has programmed his first website and since then he has been working on web technologies until now. He is the Founder and Editor-in-Chief of BriefNews.eu and PCHealthBoost.info Online Magazines. His colleagues appreciate him as a passionate workhorse, a fan of new technologies, an eternal optimist and a dreamer, but especially the soul of the team for whom he can do anything in the world. The Effective Remedies to Stop Gums from Bleeding? How to Clean White Shoes Covering Leather, Canvas & Suede? Home Remedies for Terrible Headache!